Chemistry: Al 2 SiO 4 (F, OH) 3, Aluminum silicate fluoride hydroxide. Uses: gemstones and optical properties are useful in industry. Topaz is a common gemstone that has been used for centuries in jewelry. Its golden brown to yellow color is classic but is confused with the less valuable citrine, which is sometimes sold under the name topaz. The blue topaz that is often confused with aquamarine is rarely natural and is produced by irradiating and then heating clear crystals. Golden Topaz is the November Birthstone, and Blue Topaz is an acceptable (and popular) alternate birthstone for December. 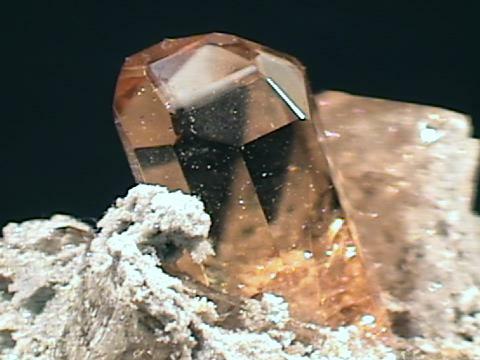 The structure of Topaz is controlled by a chain like structure of connected irregular octahedrons. These octahedrons have an aluminum in the middle surrounded by four oxygens. Above and below the aluminum are the hydroxide or fluoride ions. The chains of octahedrons are held together by individual silicate tetrahedrons but it is the octahedron chains that give topaz its crystalline shape. Topaz is the hardest silicate mineral and one of the hardest minerals in nature. However it has a perfect cleavage which is perpendicular to the chains and is caused by planes that break the weaker Al-O, Al-OH and Al-F bonds. None of the stronger Si-O bonds cross these planes. Topaz crystals can reach the incredible size of several hundred pounds. Topaz can make very attractive mineral specimens due to their high luster, nice colors and well formed and multifaceted crystals. Color is clear, yellow, orange, red, blue and green. Crystal Habits include a prismatic crystal with usually two different prisms that produce a rounded or sharp diamond-shaped cross-section. The termination is typically capped by a dome forming a roof like top. Another dome can modify the termination producing a point at the juncture of the two domes. A basal pinacoid can flatten the prisms termination or truncate the top of the domes. The pinacoid, multiple domes and occasionally orthorhombic pyramid faces can produce a complex, multifaceted and well formed termination. Topaz can be granular and massive. Associated Minerals include quartz, tourmalines, micas, brookite, cassiterite and fluorite. Other Characteristics: index of refraction is 1.61 - 1.64. Prism faces maybe striated lengthwise. Notable Occurrences include Minas Gerias, Brazil; Pakistan; San Diego Co, California; Ural Mountains, Russia; Mexico and the Thomas Range, Utah. Best Field Indicators are crystal habit, color, density and hardness.